Theories about the origin of life come and go like fashion trends. India's Vedic tradition, however, has always remained consistent on this point; "life" is the natural condition of everything; there has always been and always will be life, manifesting in infinite varieties. 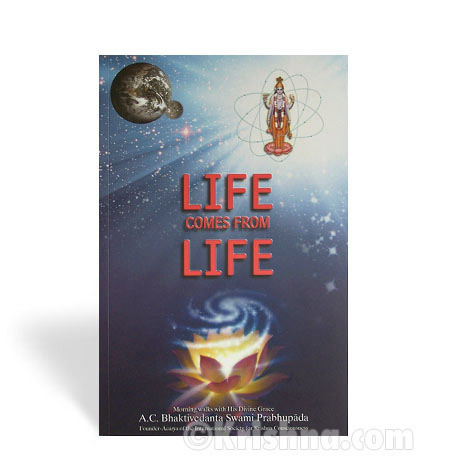 Life Comes From Life is a collection of conversations between Srila Prabhupada and his disciple Thoudam D. Singh, Ph.D., an organic chemist, in Los Angeles during the mid-1970's. Srila Prabhupada encouraged his students to use logic, reason, and scientific methods to discredit atheistic, materialistic propaganda, such as the notion that life comes from nothing. Why should we believe something can come from nothing, when all around us, every day, we see life coming from other life?